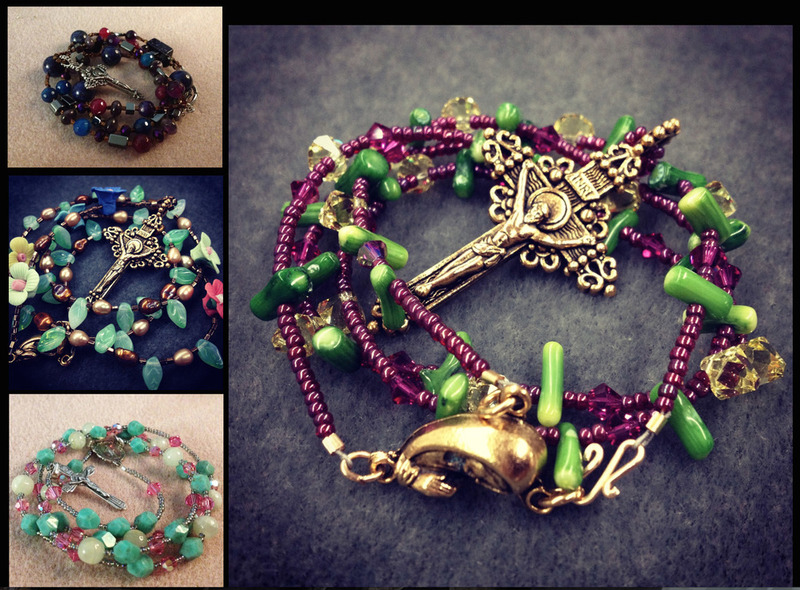 The inspiration of these rosaries came from my love of eclectic jewelry and unusual pieces. I felt rosaries were beautiful and saw art in each piece. Rosary art should be worn and appreciated and I decided to design unique and non-traditional pieces. My most popular designs are in the style of those pictured on the left. I design each rosary and I use various beads that include (but are not limited to) semi precious stones, glass, natural and synthetic beads and chain. The types of chain used in each piece vary (semi-precious metal, base metal, aluminum, etc.) and are dependent on the style and fluidity of each piece. The rosaries are made with sterling silver, copper and gold-filled clasps in the center of the piece.